Adventure Force 200 Dart Pack – Walmart Exclusive, Quality Blasting on a Budget! 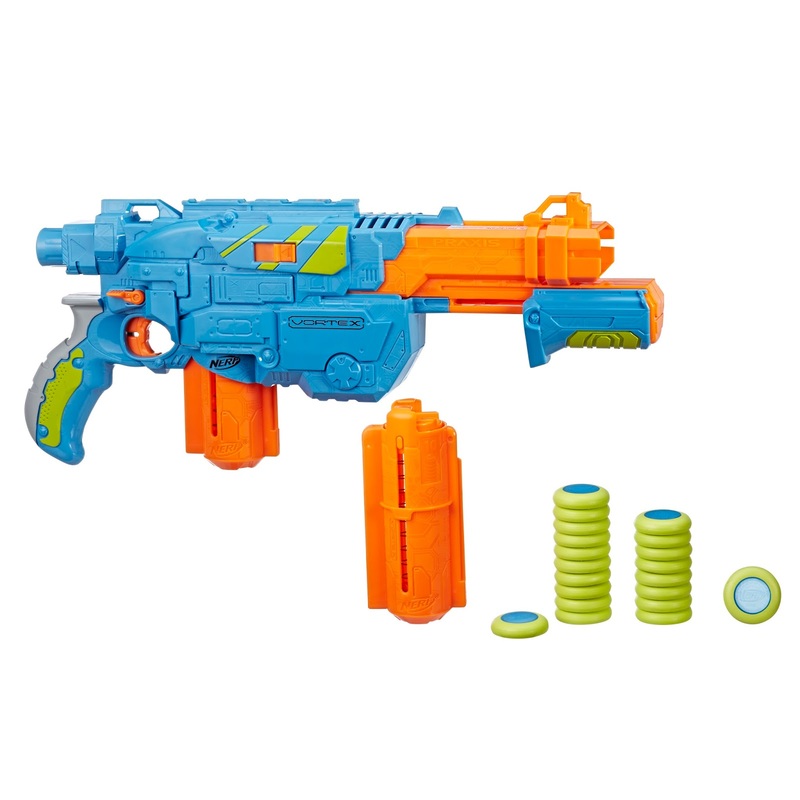 Take battling to the next level with the NERF VORTEX VTX PYRAGON blaster! With a 40-disc drum, this blaster is the highest-capacity VORTEX blaster yet. Battlers can take aim to swamp the competition with a fast-flying barrage of discs. Fire one disc at a time or fire all 40 darts rapidly with slam-fire action. With discs that can bank, curve, and ricochet, the competition will have to stay alert to keep track of their trajectory. Package includes blaster and 40 discs. Available exclusively at Target. Get ready for awesome free-style blasting with the NERF VORTEX VTX PRAXIS blaster! 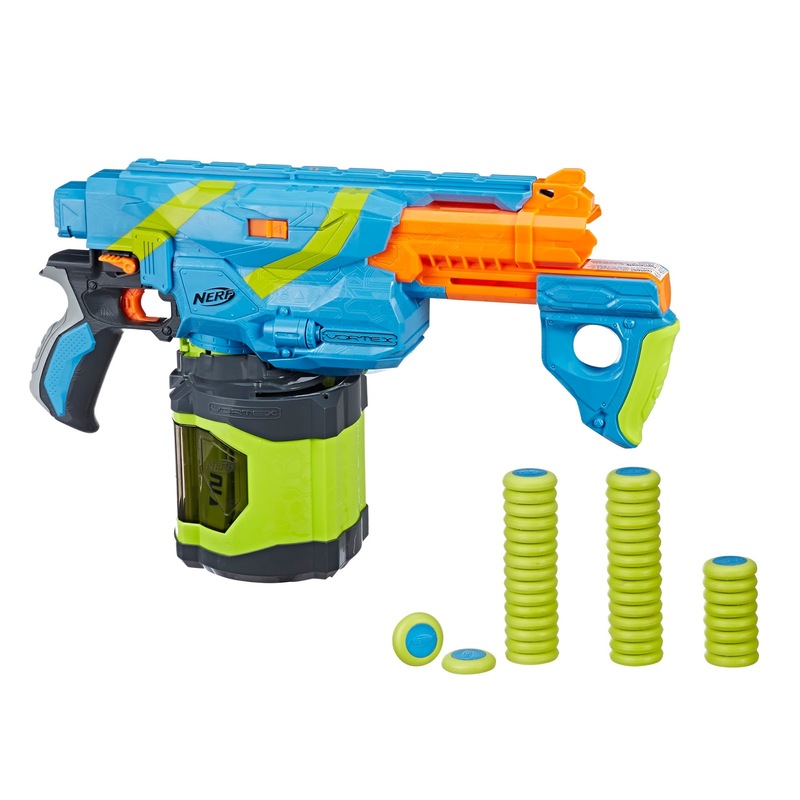 Pump-action power and removable clips allow battlers go the distance, keeping the competition on their toes.Load one clip into the blaster and keep the second nearby for quick reloading. Blast fast and create trick shots with discs that can bank, curve, and ricochet. The competition will never see them coming! Package includes blaster, two 10-disc clips and 20 discs. Available exclusively at Target. And the first shot I fired out of the Vigilon as soon as I received samples way back when. 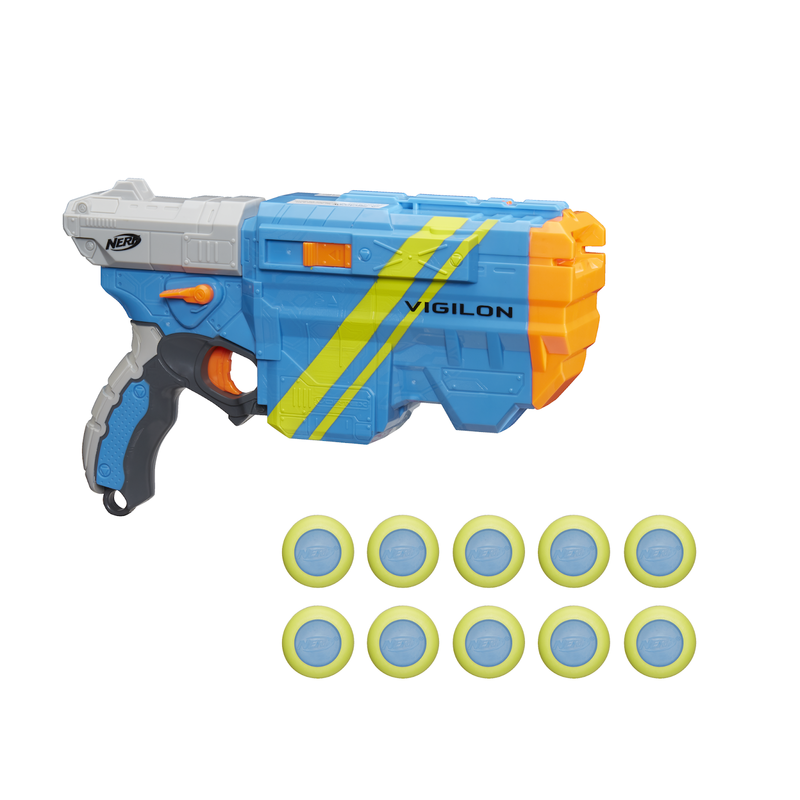 Bend the rules of battle to create all kinds of trick shots with the NERF VORTEX VTX VILIGON blaster! The VORTEX VTX VIGILON blaster sends discs soaring through the air for rule bending bombardment. Open the drop-down door to access the internal clip, load five discs inside, then take aim and send one disc at a time. Re-load the clip for minimum reloading time and maximum blasting. The battle is on! Package includes blaster and 10 discs. Available exclusively at Target. Blast discs that soar and ricochet with the NERF VORTEX VTX blasters! Create all kinds of trick shots with these soft, flexible discs. 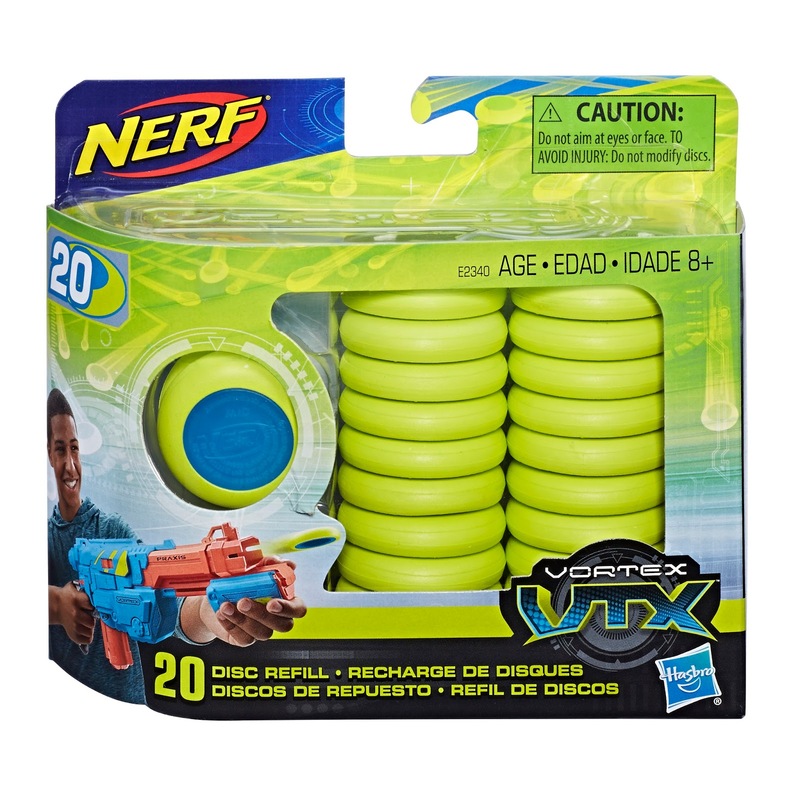 Stock up for rule-bending battles with this refill pack that includes 20 NERF VORTEX VTX discs! Includes: 20 discs. Available exclusively at Target. The initial leaked images were true! Nerf Vortex, after a few years of non-releases and hearing that lessons were learned from the line, is back! Coming out this fall (in addition to all the other huge releases) Nerf Vortex blasters are going to be exclusive to Target and having new colors with some of the old blasters of yore. No Nitron or Proton so far, but everything old is new again. The ranges were ok when compared to Nerf blasters pre-Elite but the real bonus (to some folks) was that the discs could be fired just right to hook around an obstacle someone may be hiding behind. Mr. S at Nerd Drop figured it was Nerf’s “trick shot” line, and that was pretty true considering some of the marketing that followed after. Another story that came out was that it was going to be a whole “Vortex Vs Elite” theme between the two lines, but was deemed too aggressive for the 8+ crowd (so I heard). Either way, looking forward to the samples, and now it looks like the Vortex side of my collection gets new life breathed into it! Lock and Load, Nerf Nation.